A supposed ESPN film crew told Anthony Schwartz on Thursday at American Heritage High School that it was filming him for an upcoming documentary. A little odd, yes, but football life can be odd sometimes. 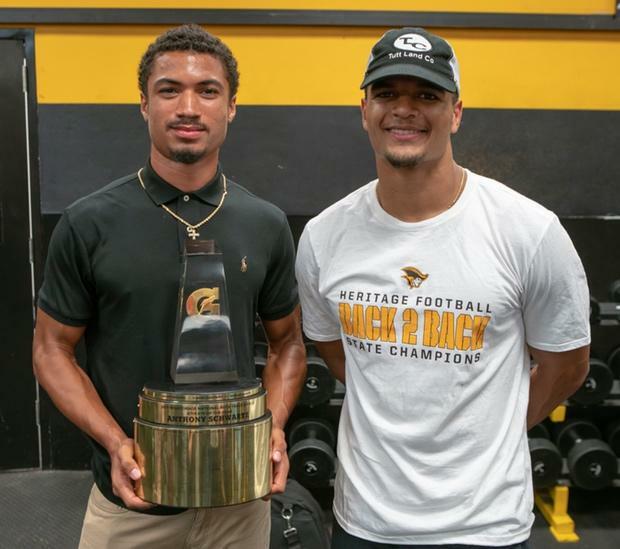 Then, Gatorade told him that his coach, Patrick Surtain, was being nominated as one of the finalists for high school football coach of the year. The football season ended a long time ago. Also odd, he thought, but football life can be odd sometimes. Then, as his teammates watched anxiously, Schwartz watched Miami Dolphins safety Minkah Fitzpatrick walk out in front of the team during the big announcement. But instead of naming Surtain, Fitzpatrick instead began to read Schwartz's name and an entirely different award. At that point, it all sunk in really quick. Schwartz, the nation's top sprinter in 2018, was named Gatorade's National Athlete of the Year on Thursday after completing one of the best sprint seasons in high school history. "It's a great honor knowing all my hard work paid off and I was recognized as the best in the nation," he said. "Not only does it show what I do on the track, but it also shows my character and what I do in the classroom." The World Youth record holder at 100 and 200 meters, Schwartz joins a prestigious list of star sprinters who have won Gatorade's top award, including two-time winner Michael Norman, the explosive sprinter and national collegiate record holder in the 400 who recently turned pro after a stunning sophomore season with the University of Southern California; Trentavis Friday, who owns the high school national record in the 100m; and Trayvon Bromell, whose resume includes a World Indoor Championship gold medal in 2016 at 60 meters and an Olympic final in Rio for Team USA. "It's just amazing to know I'm on that list now," said Schwartz, who owned a 3.92 GPA. "Also, LeBron (James) is on that list. Kobe (Bryan) is on that list. I'm one step closer to having one of their legacies." The American Heritage graduate has been sprinting away from competition all season. But on Thursday, his reward finally caught up to him. A dual-recruit for Auburn University in football and track and field, he has one more 100m race left at the U20 World Championships in Tampere, Finland, from July 10-15, but he may have already posted the most consistent and breathtaking season in high school history. He was MileSplit's No. 2 athlete on our MileSplit50 rankings for the 2018 season. 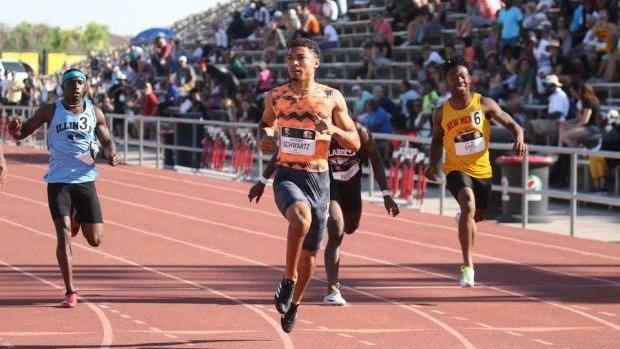 The 6-foot, 180-pound sprinter finished with a national leading and wind-legal best of 10.09 (+0.9) in the 100m at the Great Southwest Classic, though he also has three other wind-legal times under 10.20 on the season. He qualified for Team USA at the World Junior Championships by winning USATF Juniors in the 100m with a time of 10.23. He also ran an all conditions 10.07 at the state championships in Florida. He owns the No. 4, No. 6, No. 8, No. 9 and No. 13 best times in high school history at 100 meters. He's currently unbeaten at the distance in 2018. An avid tweeter, Schwartz said--as of press time--that he was still deciding what he was going to write to break to his nearly 10K followers. "I'll be thinking really hard," he said. "It's a very big moment for me." Before the season, Schwartz reached out to Noah Lyles--now 20 years old and competing for adidas--for inspiration. He knew Lyles turned pro out of high school following his win in the 100 meter dash at the U20 Championships, and simply wanted to know how he navigated things after that decision. "I talked a lot to Noah Lyles and figured out what he did," Schwartz said. "I know he had an amazing year this year. But when I first heard of him at the end of my freshman year, I wanted to have a career just like him. He finished fourth at the Olympic Trials and won World Juniors." "I feel like I'm moving toward the next level," Schwartz added. "I can have the same success." Indeed, Schwartz is headed toward that path. He was part of Team USA's win in the 4x100 last year at the Pan American Junior Championships in Peru. He has a chance in a few weeks to earn two golds against international competition in Finland in the 100m and 4x100. "I'm still trying to get a sub-10 time," he said. "But my main goal is just to win the 100 and the 4x100." He's not limited to just one race, though. Schwartz also was the second fastest sprinter at 200 meters in 2018, logging a wind-legal personal best of 20.47 (+1.3) seconds a the Sam Burley Invitational. He logged eight times under 21 seconds, including an overall best of 20.41 at the Florida State Championships, where he won three state titles in the 100m, 200m and 4x100--American Heritage finished second overall in Class 2A. Schwartz battled through what was the most adversity in his career last spring. He injured his hamstring at the state championships, which crossed off his desire to win back-to-back titles in the 100m and 200m--and potentially three straight titles in those three events. But he did show incredible character during that difficult time. He felt that injury come on midway through the 100m and still finished. Then, in the 200m, he stepped to the line even with the injury; he simply told himself he wanted to finish. Later, as he recovered and raced back up to health, he qualified for Team USA's junior team at the Pan American Junior Championships. "Just coming back and winning states in the 100, 200 and 4x100, those were proud moments, he said. But there was a reason for all of that, too, he says. Schwartz said a renewed faith in God, and a more determined relationship with his faith prompted things to turn more positively in his life. "It played a big part in my life," he said. Five years from now, Schwartz said, he hopes to have accomplished a few more things. His goal is to reach the Olympics in 2020 and potentially play in the NFL or become a professional sprinter. But he also knows his athletic career won't last forever, so he says he's going to work toward his diploma regardless. "Sports might get you through your first 10 to 15 years," he said. "but the next 20-30-40 years is all school."